Hold On To Your Helpmeet-Your Little Black Blook At one time or another prior to marriage we each had a “little black book”. Within the contents of the little black book were numbers, notes, and scribbling of moments which we felt at the time was very important. Within Holding On To Your Helpmeet-The Little Black Book, are scriptures, comments, principles and moments which we know now are very important to obtain and maintain a happy, enriched, spirit-filled, joyful and loving marriage. With over 34 years of marriage. The dynamic duo of Marion and BJ have authored the book and workbook to rekindle your marriage. 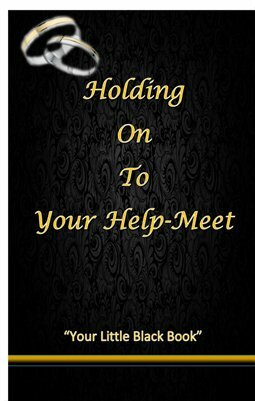 Also an excellent tool for singles to gain insight to the true meaning of matrimony Hold On To Your Helpmeet- Your Little Black Book includes a Workbook to enrich covenant relationships and build formidable unions.